This big guy's weak spot? The valve on its back. It will do anything in its power to keep it out of sight. Performing a successful counterattack will cause it to recoil. Once you have access to its weakness, attack quickly with force! x? x? x? x? x? x? 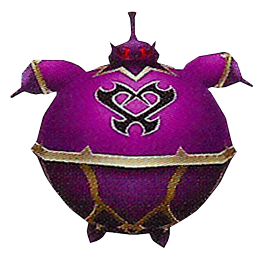 The Belly Balloon is an Unversed found in Kingdom Hearts Birth by Sleep Final Mix. The player can transform into this Unversed using the exclusive Illusion-B command. The Belly Balloon is a large, nearly spherical, bomb-shaped Unversed. Its upper body is bright magenta and its lower body is a dull, faded shade of purple with pale gold stripes. Its head is spherical with a tall antenna resembling a wick on the top of its head. Its head and the area around it are dull purple, and the area around its head has a pale gold outline shaped like an eight-pointed star. Its arms are very short, nearly spherical, and seemingly useless. Their tips are dull purple and sport short rods. There is a golden valve on its upper back. The Unversed's red eyes are set in an angry expression and a large Unversed emblem adorns its chest. It has been shown to inflate and deflate at will. It is a palette swap of the Tank Toppler Unversed.